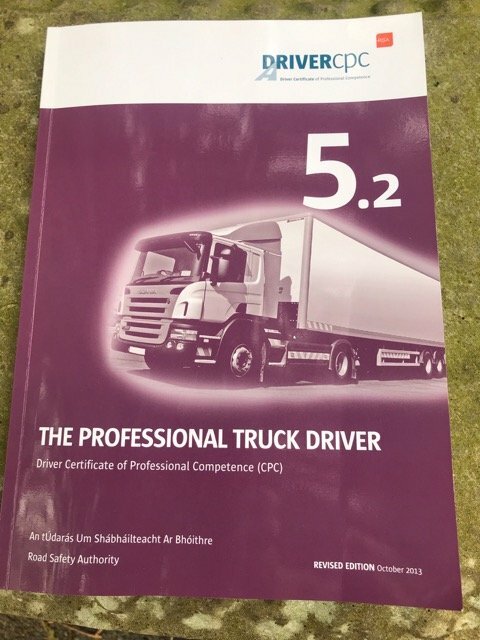 Coming towards the final year of the second cycle of the Road Safety Authority’s Driver CPC course programme via an EU Directive and Irish National legislation, the pressure is on professional truck and bus drivers to complete their final modules before the Autumn 2019 deadline, for those with licences predating 2008/9. The focus of the 7-hour course is to educate attendees to adhere to best practice with the aim to prevent and reduce road collisions as well as increase efficiencies and reduce vehicles’ carbon footprint. However, the CPC must be delivered to all truck and bus drivers regardless of their level of experience, and many of whom will attend the initial CPC programmes never having sat in a commercial vehicle before. Comments and opinions tend to revolve around the general viewpoint that the day long courses are too time consuming and tedious, and that some of the modules could be amalgamated, particularly the second time around – especially as it’s coming to a conclusion. Originally one of the other objectives of DCPC was to designate the Professional Driver as a highly regarded, certified career like other trades. Unlike some other courses or qualifications though, the initial training programme is followed up with a shorter ‘refresher course’. Some attendees mentioned the ‘Accord Dangereuse Routier’ (ADR) – The Carriage of Dangerous Substances by Road Regulations course, as an example; where the newcomer undertakes a 5-day course with an exam at the end, with the successful candidate holding the certificate for five years. To retain the qualification that person takes a shorter three-day refresher, with the compulsory exam. CPC applies to all commercial drivers – truck and bus with some exemptions. Bus drivers and drivers not engaged in the carriage of ADR traffic do not require ADR. If analysed correctly, these courses are completely different. ADR syllabus is very narrow and relates only to the transport of substances that are dangerous and their hazards. CPC relates to all substances and passengers that are transported. This opinion was highlighted by a number of ADR qualified drivers attending the recent Module 5.2: The Professional Truck Driver course which was presented by Noel Finlay at Robe Training, in Castlebar. But in reality, Driver CPC and ADR cannot be compared as they are governed by completely separate bodies of legislation and regulatory Authorities (RSA/HSA). Then there is the cost factor – ADR 5 days (packages and tanks) training, plus one day exam is priced at €800 approximately – renewed every five years, while the ADR Refresher 2 Days plus exam day, is €600 approximately. This equals 3 days (and the syllabus does not change bar the most minor of exceptions). In contrast, the Driver CPC is only 1 Day per year over five years, and has a total fee of approximately €250, with no exam. In essence, these courses are completely different. ADR syllabus is narrow and relates only to the transport of substances that are dangerous and their respective hazards. CPC relates to all substances and passengers that are transported. Attendees suggested that maybe there is an opportunity to bring together certain courses within the Driver CPC, such as combining Module 4.3 (Role of the Professional Driver in the Transport Industry (RPDTI) and the above mentioned Module 5.2 – The Professional Truck Driver (PROTD)- which covers many similar and topical issues. To explain, the revised Module 4 RPDTI – deals primarily with Tachograph legislation and Driving Hours. These regulations apply equally to truck and bus, while Module 5 PROTD, relates solely to truck and Module 6 PROBD relates solely to bus. Not all drivers are licensed to drive both classes. Another suggestion was to bring together Modules 2 & 3, Minimising Risk & Managing Emergencies in the Transport Industry with the Health & Safety of the Professional Driver. Module 5.2, which is divided into three sessions, begins with Objectives – the ability to load the vehicle with due regard for safety rules and proper vehicle use. The Directive texts cover a multitude of connected areas; motion forces, gearbox ratios, payload calculation and volume as well as load distribution plus the consequences of overloading. What the fuel distributors/drivers were well aware of was the subject matter relating to vehicle stability and centre of gravity. Securing all types of items and goods were also covered in this section. Materials handling equipment use was briefly mentioned as were defensive driving, tiredness and bridge height recognition. Session 2 is about preventing criminality, human trafficking and transport legislation, ongoing issues that need to be raised and as all present were experienced drivers, many of the topics covered by Noel led to open discussion of experiences on the road or elsewhere. The economic environment of road haulage and the organisation of the market was the heading for Session 3 which was all about regulations, both national and international. Other modes of transport from air, rail and sea were highlighted, together with changes in the industry, all of which invoked discussions amongst the course attendees. It could be said that these courses when initially created, great concern was expressed about the dictatorial aspect of how the modules would be delivered. Over the years, and particularly as the second phase arrived, the repetitive nature of the text has led to more conversation between participants, and due to the diversity of those present, the collective experiences and solutions to problems or issues highlighted during the sessions prove beneficial to all. Although efforts are made to make modules interesting within the framework of the EU Directive legislation, it states that truck drivers must complete 35 hours training over a five year period. However, it is Irish legislation that states drivers must compete one 7 hour module per year, (6 modules for those who hold both truck and bus licences). Other than shortening the course timeline or combining some modules, the third phase of the DCPC may prove less interesting and compelling for the attendees. While efforts are made to make the syllabus interesting, there will at this level of training (basic) always be some amount of duplication. It should be noted that the repetition of sections of text for example sections on fuel economy were demanded by some prominent members of the industry. To relive this aspect drivers should vary the schedule of modules to minimise this by not repeating a Module until the fifth year where by it would have been revised. However, the course content prescribed by the EU Directive must also be delivered to drivers engaged in all manner of work from car transport to fridge work to tanker to low loader. The courses are constantly under review and all from the industry owners, operators and drivers, are welcome to apply to sit on the review panels and have an input. We expect workers in other sectors to be professionally trained and to receive regular updates on new methods of work and best practice. Nurses, electricians, teachers, Garda, the RSA – why is the transport industry different? Again the industry demands professional well trained ‘experienced’ drivers but do little to engage in the process. At an approximate cost of €50 for seven hours training by an accredited professional trainer it is not bad value for money, and few drivers or trainers sitting a course would not learn something during the day.